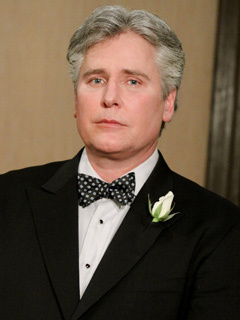 Michael E. Knight was born in Princeton, N.J. but spent his early years on the West Coast in Ojai and San Francisco. He grew up as the middle child of three sons attending a boys' preparatory school where his father was a faculty member. At the age of 12, his ambition for acting surfaced. He earned a degree in theater arts at Wesleyan University and then moved on to the prestigious Circle in the Square Theater in New York for more technical training. In 1983 he landed the role of Tad "The Cad" Martin on ALL MY CHILDREN. Four years into his run, he left to pursue acting projects on the West Coast including the feature film Date with an Angel. He returned to AMC in 1998, stayed for two years, and then left Pine Valley a second time. Knight came back in 1992, and has remained at AMC ever since. Knight has also had notable guest appearances on MATLOCK and MURDER, SHE WROTE, and he has appeared in several theatrical productions as well. The three-time Emmy winner resides in New York City. Was a half-hour late to his own wedding. Reconnected with pal Valerie Bertinelli over the Internet. Earned his degree from Wesleyan University in only three years. Once spent three hours in a chatroom trying to convince AMC fans he was Tad. More ABC Daytime Faves To GH? Michael E. Knight, Y&R's quirky Dr. Simon Neville, has been let go. Y&R has snapped up beloved AMC star Michael E. Knight (ex-Tad) to play the recurring role of Dr. Simon Neville, TV Guide reports. In the wake of Cady McClain's announcement that she is reprising the role of Dixie on Prospect Park's AMC reboot, and with Jill Larson (Opal) already signed, Digest went straight to the source behind the man so pivotal to both Dixie and Opal — Michael E. Knight, whose Tad was Dixie's fiancé and Opal's son — to see where he stands on the subject of reprising his beloved role of Tad "the Cad" Martin. AMC alum Michael E. Knight (ex-Tad) is starring alongside Robin Riker (ex-Beth, B&B) in Blank Theatre's production of The Cost of the Erection. Pine Valley favorite, Michael E. Knight (Tad, AMC), has penned an heartfelt article entitled "Goodbye to My Soap Star Life" in the Daily Beast.